Arcana Strikes (アルカナ・ストライクス) is a RPG game, published by TAKARA, which was released in Japan in 1997 for the Sega Saturn. 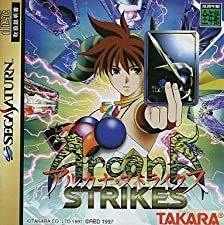 Arcana strikes Sega Saturn SS Japan VG Condition! Japanese Game Sega Saturn Arcana Strikes Takara Very Good Shape !